Like the Embarcadero freeway, San Francisco’s Central Freeway was partly built during the 1950s before it was stopped was stopped by San Francisco's freeway revolt. All that was built was a freeway spur to the west of San Francisco’s Civic Center. Unlike the Embarcadero freeway, the Central Freeway was not on spectacular waterfront property, so there was not an early movement to remove it. But after the 1989 Loma Prieta earthquake, this freeway was damaged and closed, like the Embarcadero freeway, inspiring a movement to remove it rather than repair it. The battle over removing the Central freeway dragged on for many years. The main opponents of removal were residents of west San Francisco - the lowest density part of the city - who used the freeway to drive to their homes. The battle was so fierce that citizens initiatives brought it to the voters three times. Ultimately, the city decided to remove the Central Freeway and replace it with a ground-level boulevard, which opened up land for new housing and led to the revival of the surrounding Hayes Valley neighborhood. The Central Freeway was part of San Francisco's 1951 plan to crisscross the city with freeways, the same plan that included the Embarcadero Freeway. The first phase of the Central Freeway opened in 1959, the same year when the Board of Supervisors voted to cancel seven of the ten freeways planned for the city, after receiving petitions signed by 30,000 San Franciscans, as described in the section about the Embarcadero Freeway. This vote canceled the Central Freeway as well as the Embarcadero Freeway, leaving the spur of the Central Freeway that had already been built, which went from I-80 across Market St. and through in the Hayes Valley neighborhood to the west of San Francisco’s Civic Center. The part of the freeway that goes north past Civic Center would have continued north through the center of the city and then connected with the Golden Gate Bridge. The ramps that turn west before reaching the Civic Center would have gone half-way through Golden Gate Park before turning north and connecting with the Golden Gate Bridge, providing freeway access to the western neighborhoods of the city. After the project was stopped, these ramps connected to Fell and Oak Streets, a pair of one-way streets that led to the roads in Golden Gate Park - not a freeway, but still a relatively fast route to the neighborhoods in the west of the city. During the early 1960s, the freeway planners tried to resurrect the freeway through Golden Gate Park and the narrow park to its east called the Panhandle. In 1964, Sue Bierman, a resident of the Haight-Ashbury neighborhood that is just south of the Panhandle, organized a neighborhood group to campaign against this freeway. The group organized a rally in the Polo Grounds in Golden Gate Park on May 17, 1964, which featured a speech by the poet Kenneth Rexroth and a song named “The Cement Octopus” that folksinger Malvina Reynolds wrote for the occasion. Politicians derided this group as a collections of “housewives” who could never have an effect on city government, but by the time the freeway plan came before the Board of Supervisors, 77 community organizations had taken positions opposing it and the Supervisors' Transportation Committee had received 20,000 letters and a petition with 15,000 signatures opposing it. If it had not been for that last minute change of heart, the freeway would probably have been built through the Panhandle and through Golden Gate Park. After the 1989 Loma Prieta earthquake, the northern portion of the Central Freeway was damaged so badly that studies showed it could not be rebuilt. Caltrans removed it in 1992, and in the same year, the Board of Supervisors voted to ban any new freeways north of Market St., so this part of the Central Freeway could not be replaced. The land that it occupied was slated for housing. The southern portion of the Central Freeway still remained, south of Market and five blocks north of Market, up to the off-ramps that connected to Fell and Oak Streets, carried traffic to the park, and to western San Francisco. This remaining stretch of freeway north of Market St. ran above Octavia St., and in 1995, a city task force recommened that the freeway should be replaced by a surface boulevard, named Octavia Boulevard. Replacing the freeway with a boulevard would slow cars going to Fell and Oak Streets a bit, but it would make it easier for cars going to local destinations to turn onto other cross-streets. But Caltrans, the state Dept. of Transportation, decided that this freeway was worth saving. It reopened the existing freeway to traffic, and it developed a plan to demolish its upper deck and expand the lower deck so it could carry traffic in both directions.. In fall of 1996, Caltrans began demolishing the upper deck. There were predictions that there would be gridlock on the day that it closed the freeway to traffic to begin demolition, but the local streets were able to accommodate the traffic without any significant backups. Soon after demolition began, flyers began to appear on the freeway that read “Mayor Brown, Tear it down!” Patricia Walkup, a long-time neighborhood activist, and Robin Leavitt, a neighborhood resident and architect, emerged as the main leaders of the movement to remove this freeway and replace it with Octavia Boulevard. San Francisco Mayor Willie Brown soon came out in favor of this plan. However, residents of the western neighborhoods of San Francisco were organizing in favor of Caltrans' plan to rebuild the freeway. In 1997, they convinced Caltrans and Mayor Brown to reopen the lower deck of the freeway to traffic - carrying traffic to Fell St. where it could continue west. They also circulated a petition to place an iniative on the 1997 ballot saying the freeway should be rebuilt. They claimed that the 97,000 cars that used the freeway each day would back up and block Market St. if the freeway were closed - though traffic had not backed up across Market St. before the freeway reopened. Mayor Brown, an adept politician, withdrew his support for the boulevard plan. The initiative won by a small margin, and Caltrans began once again to design the new Central freeway. Then, in 1998, freeway opponents, led by Walkup and Leavitt, gathered signatures and put the issue on the ballot once again. Their initiative to remove the freeway won. In 1999, there were two initiatives on the ballot, one to rebuild the freeway, which had been circulated by west San Francisco residents, and one to remove, circulated by neighborhood residents led (once again) by Walkup and Leavitt. The voters decided to remove the freeway. Pro-freeway forces considered gathering signatures for yet another initiative, but they decided that everyone had already had enough of the issue. There was a long debate about how much of the freeway should be demolished. Environmentalists wanted to demolish most of the section south of Market St., so traffic would disperse on local streets before crossing Market. 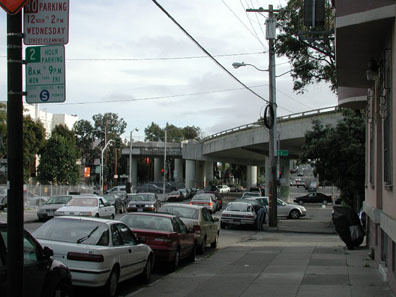 There was also strong pressure to keep the freeway overpass over Market St., so it could connect with Octavia Boulevard without crossing and potentially disrupting Market St. In the final compromise, there would be no overpass over Market St., but Caltrans would rebuild the Central Freeway through the marginal light-industrial district south of Market St. - making it likely that this district will remain marginal and will not be revived. Removing the upper part of the Central Freeway had required little change to existing street patterns. Removing the lower part of the Central Freeway was a more interesting design problem, because it involved creating the new Octavia Boulevard to replace the freeway. Traffic that leaves the Central Freeway can cross Market St. and continue north on this boulevard. Before: View Across Market St. of the Central Freeway and Octavia St.
Now: View Across Market St. of Octavia Boulevard. The center lanes carry heavy traffic to and from the freeway. The service lanes buffer the adjoining housing from the traffic. The boulevard was designed by a team led by Allan Jacobs, formerly San Francisco Planning Director, a professor at UC Berkeley, and author of the book Great Streets. It is 133 feet wide, with four lanes for through traffic, a landscaped median, and two service lanes for slower traffic and bicycles, separated from the through lanes by a landscaped median with a sidewalk. In this type of boulevard, the service lanes buffer the adjoining housing from the noise of through traffic, so the boulevard remains a pleasant place to live, even if it has heavy traffic. Even after building the boulevard on 133 feet of the freeway right of way, there is still 15 to 48 feet of land east of the boulevard that will be used for new housing. Many Hayes Valley residents called for dense pedestrian and transit oriented development, without much parking. After consulting with the neighborhood, the city’s Planning Department developed a plan for transit-oriented development on the strip of land next to Octavia Boulevard and on the other land freed by the earlier removal of the northern part of the freeway. 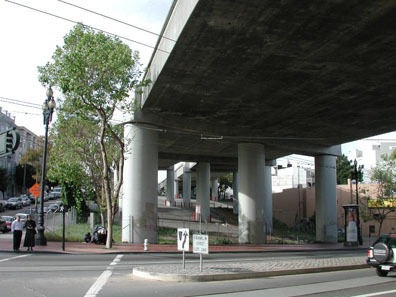 Before: The northern stub of the Central Freeway, with the ramp that carried cars to Fell St.
Today there is a neighborhood park at the northern end of Octavia Boulevard. Note the cars in the background turning from Octavia Boulevard onto Fell St. The design also includes a new park at the end of the freeway. North of where the through traffic turns west onto Fell St., the boulevard’s service lanes continue another block to Hayes St., but the center lanes are not needed and have been replaced by a park and playground. Demolition of the final stretch of the Central Freeway finally began in 2003, almost fourteen years after the Loma Prieta earthquake. Octavia Boulevard was completed in 2005, and the rebuilt Central Freeway south of Market was completed in 2006. The removal of the northern portion of the Central Freeway had already sparked a revival of this part of the Hayes Valley neighborhood, and interesting restaurants and shops began to appear on Hayes St and to attract people who worked or did business in the Civic Center. Replacement of the southern portion of the freeway with a boulevard and park made neighborhood businesses even more attractive. 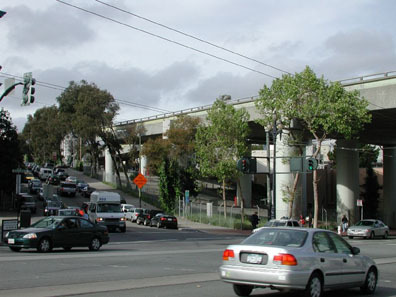 In June, 2006, Octavia Boulevard was awarded the Freeway Project of the Year award by the California Transportation Foundation. A few days later, Patricia Walkup died at age 59 of diabetes and related conditions, after spending two month's in the hospital. The park at the northern end of Octavia Boulevard, which had been named Hayes Green, was renamed Patricia's Green to honor her. freeway has been replaced by a boulevard and park. In 2003, the weekend before demolition began, freeway opponents had held a massive street party under the freeway next to Market St. Robin Leavitt, organizer of the campaign to tear down the freeway and of the party to celebrate, told the press "This demolition finishes the end of the freeway wars. It's a time when San Franciscans have decided they prefer living in San Francisco rather than driving through it."